So what are they? What do they do? Where do you get them, and how should you use them. All that and perhaps more, after the break. 1. What are these troops? Basically, they are overpowered troops that each have a specific strength. They are advertised as Goblin killers, and they do that description justice. In some sense, they can be seen as Tier 6 troops, but this isn’t justified completely. For one, they have no might value or low might values, so for growing your might, you don’t need these troops. Secondly, they do not have a prescribed troop type attached to them. While Tier 1-5 is divided into Mounted, Foot and Ranged troops, at least the Stone Giants and Master Rangers are none of the above, and are as deadly and as vulnerable to all troop types equally. Lastly, besides troop type, they also do not adhere to one of the races in the game. Neither Dwarf nor Elf, they are equal to all players. So, let’s go through each of these units and see what their strengths and weaknesses are. After the individual discussion, numbers are given in table form. Pack Mammoths serve the purpose of being incredibly big supply units. They carry massive loads around; Their base load is 55k resources, or 110k with lvl 10 Saddlebags! That is almost ten times the amount T5 Supply Columns can carry. With the increased load, the upkeep is also higher, but at 60 upkeep/Mammoth, still relatively lower than other supply units. The possible downside to these units is that they are quite a bit slower compared to other supply units, and even compared to normal troops of lower tiers. So if you need to ship RSS fast, use T5 supply, otherwise, these Mammoths are the way to go. As supply units, these Mammoths do not have an attack value, and life values I haven’t determined yet. They have 10 might, so you wont lose much if you happen to get these killed…which you shouldn’t. The Master Rangers are the attack force of any Tactical Troop army. They are advertised as the Goblin Killers, and sport incredibly high damage to earn that reputation. They do roughly 3.5 times the amount of damage compared to T5 units (without Strong/Weak bonus). In terms of speed, they are slightly faster compared to T5 troops, and almost as fast as T5 supply. With 6 upkeep per Ranger, they need less food than even T3 supply, so that’s a plus as well. They have 10 Might, gone up from zero before, which still makes them ratio friendly troops to attack other players with, although some people frown upon their use it that way. But do keep in mind, that their attack against other players drops to 8! Only in campaign do they fully utilize their 32 attack! The trade off to their high attack power is their lower defense, much lower compared to other tier troops (relatively spoken). This means they need some other troops to catch the blows while they finish of the enemy. Luckily, they are attacked last in an attack, after other tiers of attack units. In The Hobbit, the Stone Giants are only shown briefly, and without much context. But from their appearance, these giants can take some blows, and it would take an army to take them down. While not literally the case, this is exactly the role they play in Kingdoms of Middle Earth. They are the Tank, the damage absorbing units. They sport the exact opposite stats of the Master Rangers: Incredible high life values, but low attack values. They can take roughly 2.5-3 times the amount of damage as T5 troops. Left to their own, they are pretty helpless -having an attack value between tier 1 and 2-, but backed by T5 or Master Rangers, they will lead the attackers’ attention away from the other units and considerably lower your losses. Their large size does make them somewhat slower than other units, even slower than T3 troops. On the other hand, they need no food at all. Although formidable defenders, the Giants sport 100 Might. Not zero, but definitely much better might/defense ratios compared to any other troops! Also, beware of Woodsmen, as they fight very efficiently against these monsters! One of the new troops added is the Lyncean Raider, a swift wolf-like creature which is to be used as a scouting troop. To do this it is by far the fastest unit in the game, with a speed of 3600. That is more than double the amount the second fastest unit so far, which is the Supply Column (t5, 1500 speed). Unfortunately, for actually taking resources, you will need to send other troops, as the Raiders have zero load carrying capacity. This makes me wonder how useful these units are for their intended purpose, but who knows. Battle wise they are pretty average for their might and availability. They have slightly higher attack compared to t4 units, but lower than t5. Their defense however is better than t5, so they can take some punches, but that should be of no concern to these troops and their use. Also be careful not to waste them on open cities, as they do have 100 might! No upkeep required means you can put them in any city you like without worrying about food stockpiles. The second newly added troop is the Woodmen. These glass-cannon type units can dish out quite some damage, but are fragile if left on their own. The Woodmen have over 1.5 times (14.25) the attack of T5, but lower defenses. Additionally, it is important to note that, like the Stone Giants, they always fight and die first, even before T1 and the Giants themselves! They are however formidable against enemy Stone Giants! Besides high attack and average defense, they also sport 100 Might and zero upkeep. Add 1400 speed, they are also pretty fast, almost as fast as T5 supply, however not nearly as fast as the Lyncean Raider. Also don’t expect to use these for farming, as they have almost no carrying capacity. A new ranged unit from the shores of Lake-town. From the looks of it, these are gonna be long-range, high damage and low-life troops, dealing large amounts of damage to the enemy from behind other units. Their description mentions “..only the fastest units may reach them..” so I expect them to be vulnerable to Lyncaen Raiders. They sport 100 might, have the speed of T3, and a considerable upkeep of 30. Attack and defense values are given as 5* and 2*, but translation to actual numbers can vary with TT, so more on this to come! The second Tactical coming from Lake-town, these foot units appear to be the cannon fodder of the Tactical ranks. This seems evident from the low might (6), 4 upkeep, low (400) speed, and 2* star attack and 1* star defense. What exact numbers these translate to and what the Pikemen’s specific strengths and weaknesses are will be added as soon as possible. Please note, that for the defense values, I’ve cut my numbers in half to better reflect the information given out by Kabam. Also, for the Giants defense, my numbers differ pretty badly from what Kabam gave in their forum post (red number), but this is probably due to troop types. 3. Where do you get them? Now of course you are all eager to find out where to get those. Unfortunately, options are limited. As stated in their introduction, these units can not be trained as of yet (no clue whether this will be possible ever). So you need to win or buy them. They usually turn up in small quantities in chests for sale in the shop, so if you want to spend some mithril, go buy them. Also watch out for Premium sales, these tend to have a lot of Tactical Troops as well, so save up your tokens! You can also win them in all rounds of Tauriels Circle of Fate that I have seen. Each iteration usually focuses on one of the three troops, so watch out for ones that offer the troops you need most! Lastly, they are offered as prizes in some tournaments, so if you have a strong alliance, that’s another way to win them. So, with the above described attributes, it is clear there are some distinct uses for these troops. 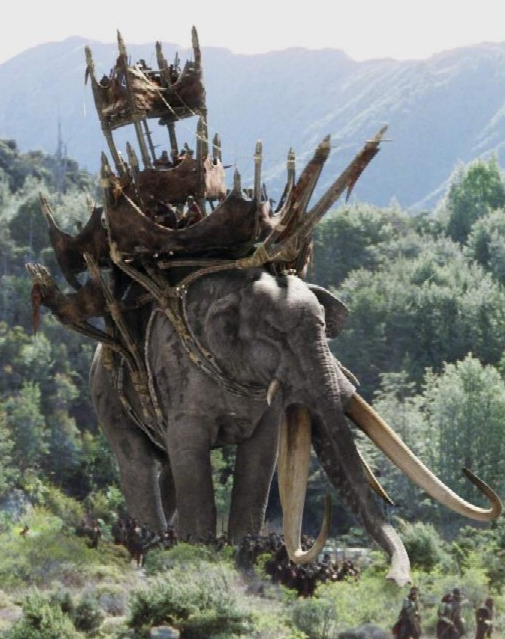 Well, maybe not the Mammoths….they are just supply troops, so nothing really special here. The main intention for these troops were to use them in campaign, and rightfully so. We can start to forget anything we know about campaign guides, what troop types to send in, and forget our previous high scores. The Tactical Troops are gonna change the landscape. Of course, you still need to figure out the best ratios of Stone Giants and Master Rangers, but it is made easier due mostly to the lack of troop type of these units. So figure out the right numbers for your setup, and watch your scores explode! The attributes of the Stone Giants and Master Rangers also make them very suitable to add to your normal combat set-up, whether defending or attacking. Now, let me first say that I have no clue whether these units perform as well against Elves and Dwarfs as they do against Goblins. The Master Ranger description does read “..Their skills might be lost on Dwarves and Elves”, but I’m not sure whether that refers to their combat performances, or their skills against Goblins alone. It is in fact confirmed now the Rangers only fair well against Goblins, and do much worse against other players. But potentially, adding in Master Rangers to an attack army might greatly increase your TK’s. Conversely, having a batch of Stone Giants in your city when under attack might dramatically lower your losses. If you know you can zero an open city, you might even want to add Stone Giants to attacking armies as well. Also expect to have the ‘Cart rein’ trick be replaced by massive reinforcements of Stone Giants instead. Using the Raiders is something that I have to personally see yet. I’m not sure whether there is an actual use for them (worthwhile) in battle, at least not in the role as described by Kabam. The Woodmen do pretty well in combat, and are being used (on my server) to counter the massive amounts of Giants at every open city at the moment. The only problem so far with these units and other TT, is still the fact that unless you spend, they are hard to come by. Fingers crossed and hoping that Kabam will make these units trainable soon. The great advantage of course is, besides their incredible battle performance, the fact that they have little or no might, so they can easily skew TK/Might ratios in your favor when used correctly. The downside of course is the fact the troops need to be bought or won, so unless you can spend a lot of mithril, keeping up the Tactical Troop numbers in your army is gonna be hard if you use them for all above mentioned situations. That’s all for now on these Tactical Troops. If I find out anymore, I’ll add it here as soon as possible. This entry was posted in Articles, Strategy, War and troops and tagged attack, attacking, campaign, cart rein, chest, circle of fate, city, combat, defending, dwarf, elf, game update, Goblin, kabam, kingdoms of middle earth, KoM, lake-town, laketown, life, load, longbow, longbow archer, lyncean raider, Master Rangers, might, mithril, non-trainable, Pack Mammoths, pikemen, premium sale, Speed, Stone Giants, supply troops, tactical, Tactical Troops, tier, tier 3, tier 5, tier 6, tokens, tournament, troop, troops, upkeep, woodmen by beardmonkey. Bookmark the permalink. The lycians are great for… The looked down upon wild raiding. You can send one and it hits fast and conquers an undefended wild. My alliance recently ended up in a flip war and the raiders proved their worth. Any plans on updating exact attack and defense modifiers for laketown troops? I know Archers have more attack than t5 cause I tested it, but would be great to know exact numbers for that as it seems pikemen are being praised for defense and archers can be of use to deal damage. great to hear! Ill update all the attack numbers asap. Thanks! In a previous article you mapped out what type of troops they will attack first. In this under the attacker column you included t1-5, stone giants, master Rangers, woodmen, and Lycan raiders. Would it be possible to update this including the lake town longbow men and pike men (although it seems those are more for sacrifice than battle). Another player had 84,000 mr, 40,000 bowmen, 21,000 sg, and 60,000 pikemen at a cavern I needed to take over. What would you use? From looking at the old post/chart of attack order Lycan raiders would be an asset against sg and from what I’ve read against bowmen. But not mr. I use LR in TK tourneys and also during might tourneys for TKs. Due to their speed, I can hit a entire ally in a couple of hours just by sending one to every city. As near as I can tell, Lyncean Riders and Woodmen have zero might…. Nope, sorry, but you’re mistaken…they both have 100 might. I just popped a thousand of both to confirm. Very bizarre. I’ve dropped a couple thousand of each as well trying to confirm – nothing, zero change in might. Stone Giants and Pack Mammoths spot on tho. massively weird….I popped another k of each to re-re-confirm, and got 100 might per Raider and Woodmen again…Would this mean the number differs per server lol? And are you guys sure you can SEE the change in might change? For example, if you have over 100m might, you will only see changes in might above 10,000. Or try refreshing your game after popping, mught be slow in updating. I’ve also already tested. DragonAsh is right. Lyncean Riders and Woodmen have no might. This was apparently a bug, and initially the Woodsmen and Raiders produced no might. Sometime around May 1st this was corrected. Corrected, as in, now supposed to have 100 might each? ‘Cause I’m still seeing zero might for both Raiders and Woodsmen. You know, I wonder if this is something they are correcting world by world. I saw it on the message boards before I saw it in the game. Then one night, my might jumped up about 4 million and now when I open them, they open and show the correct might. This article by Kabam should help you! Love the work you do. when you were finding attack and life values did you experiment in campaign or against other players? The reason I ask is because the strength modifier applied to master rangers is strong vs goblins and weak vs elves and dwarves. At any rate, do you data about that type of thing? perfect, in my opinion. They have a pvp use, but given their scarcity for free players, a campaign focus was my concern. Thank you very much for your data. I noticed the defensive stat for master rangers is blank. I haven’t had the chance to dive into it yet, myself, but from what I have seen in game, they have a defensive stat, for sure. i know, but I have only 1500 of em, so dont wanna waste them on these tests. Giants in contrast, i have thousands of. And in the end. you wanna have your numbers such that you dont lose Rangers at all, hence why I didnt bother to further investigate their life values. But if you have the numbers, Ill be eager to hear them! sure I can forward them 🙂 When I have them confirmed, I will post on my tk-oriented wordpress site. do you want the link? sure, Ill gladly look it up! have you had any experience with using the giants to hit? I was hit with 2k giants, backed by 120k t5…..and they wiped my 12k giants with better ratios than i would have otherwise… but when they only hit my t1 in another wave…they did worse… do you know if giant vs giant meants equal ratios? Nope. Ive seen people attack with them, and always wondered why. Seems to me the only time it would be effective is when you can zero someone and you have troops surviving, then they can increase survivalrates. But if you run into an open city with millions of troops, your army is gonna be wiped in one round anyways, so defense doesnt really matter. 100k stone giant means 50attacks…..awesome defensive power!! Just been checking this by sacrificing one of each troop and I get 10 for the Mammoth. Agree that giants are 100 and Master Rangers are 0. Any idea what the base city might is? I think city 1 was 5. After 3 cities I had 65 and now after 4 I’m carrying a consistent 680 point discrepancy between calculated troop might and actual might. ok thanks! About the city might…never heard of that??? the fact you can be zeroed while having four cities would speak against what you just said about it….? Haven’t personally been zeroed but did lose all my troops one time. My spreadsheet calculates might and I always had 5 might unaccounted for. Stupidly wiped myself out attacking Smaug and still had 5 might with 0 troops. Noticed a while later that I consistently had 65 might too much compared to my spreadsheet once I had 3 cities so I assumed each successive city had increasing base might. Now with 4 cities I’ve got 680 unaccounted for. Must be some other glitch and nothing to do with base might if people do truly get zeroed. Thought mayb they just meant no remaining troops. Don’t want to lose all my troops in the interest of science though. On another note, any idea what Bilbo’s Treasure is? Just got one in a good customer gift. How are you supposed to get 100k giants? buy them in the boxes in shop. Some of these give a thousand giants for just a few mithril. And some players happily spend 200-300 euro just to stock on these troops…. Ive seen a guy from the number one alliance on our server with over 500,000 giants, and Im pretty sure their will be others with way more….